The thirtieth ancestor in my 52-week challenge is my maternal 3rd-great-grandfather, Jean [John] Baptiste LAURENT. He was born in 1825 on January 18th. A birthday he shares with another famous person. Me. He was born at the small town of Biez in the Chaumont-Gistoux municipality in Walloon Brabant, Belgium. Chaumont-Gistoux is located on the KW-line, which was a defensive line built during World War II to help prevent the German invasion. His parents were Constant Joseph & Marie Josephe (Bero) Laurent. I have noted that he emigrated from Belgium in June 1856 through Detroit, Michigan, but I have no source attached, so I don’t know how true that is. I’ll need to confirm that. In September 1856, he married Olivine Marie ST. LOUIS in Little Chute, Outagamie, Wisconsin, daughter of Ephraim and Marie DesAnges (Manseau) St. Louis. I wrote about Marie earlier in this challenge. Together, they had nine children, including my ancestor, Mary Philomene (Laurent) DeBroux in December 1865. They lived and farmed in the same general area in central Wisconsin throughout these years. Jean passed away on 31 July 1886 in Phlox, Langlade, Wisconsin and is buried at St. Joseph’s Catholic Cemetery in nearby Norwood Township. This post is 30 of 52 in the “52 Ancestors in 52 Weeks” Challenge” begun by Amy Johnson Crow. The history of my family for this week. As always, you can find this information anytime on the Dates & Anniversaries page. 1842 – Born – John HUIZEL – John is my wife’s great-great-grandfather on her father’s side. He was born in Bohemia, Czechoslovakia. He married Barbara REINDL in about 1864 and they had 5 children, all of them before emigration to the US. He passed away on 19 Mar 1903 in Iowa and is buried at Bohemian Cemetery in Plymouth, Cerro Gordo Co., Iowa. 1809 – Married – Constant Joseph LAURENT & Marie Josèphe BERO – Constant and Marie are my 4th-great-grandparents on my mother’s side. They were married at Piétrebais, Walloon Brabant, Wallonia, Belgium. Together, they had 4 children including my ancestor Jean-Baptiste LAURENT. They both passed away at Biez, Chaumont-Gistoux, Walloon Brabant, Belgium, Constant in 1841 and Marie in 1853. 1848 – Born – Peter MUHM – Peter is my 3rd-great-grandfather on my mother’s side. He was born at Palatine, Montgomery Co., New York. He married Ida SCHAVANDIE in about 1870. They had 4 children born in Wisconsin. 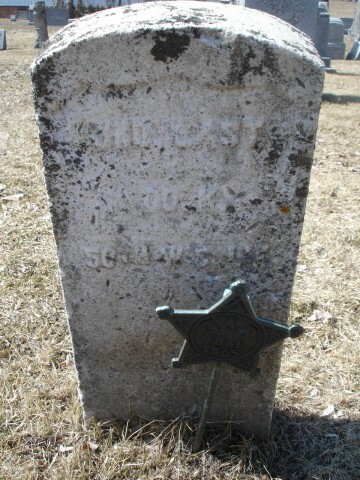 Peter passed away at 39 on 6 May 1888 in Langlade Co., Wisconsin. His wife lived almost 50 more years when she passed away in 1934. 1872 – Died – Dorothea (COOK) MORAN – Dorothea is my wife’s 3rd-great-grandmother on her father’s side. She was born 8 May 1825 in Cork County, Ireland. In 1845 she married Robert MORAN. Together they had 9 children on their travels from Quebec, Canada to Wisconsin. Dorothea died in Grant Co., Wisconsin and is supposedly buried at Old Rock Church in Livingston, Grant Co., Wisconsin. 1920 – Died – Olivine (ST. LOUIS) LAURENT – Olivine is my 3rd-great-grandmother on my mother’s side. She was born 17 Sep 1835 in Yamachiche, St. Maurice, Quebec, Canada. In 1857 she married Jean-Baptiste LAURENT (son of Constant and Marie above.) They had 9 children including my ancestor, Mary Philomene LAURENT. According to my notes, Olivine was the first school teacher in Phlox, Wisconsin. Note write up on the History of Outagamie County regarding the early days at Phlox, Wisconsin. The school is now torn down. Olivine passed away in Phlox, Langlade Co., Wisconsin and is buried at St. Joseph’s Catholic Cemetery in the nearby Norwood Township. 1838 – Died – Lawrence MINK – Lawrence is my wife’s 5th-great-grandfather on her father’s side. He was born 8 Nov 1773 in Fredericktown, Maryland. He married Mary Elizabeth LOWRY in about 1795. He passed away in Preble Co., Ohio. 1774 – Born – Friedrich Ernest MUHM – Friedrich is my 5th-great-grandfather on my mother’s side. He was born in Schwbendorf, Landkreis, Maurburg, Hessen, Germany. He married Gertrude OPPERMAN in 1795. He passed away on 24 Jan 1850 in Schwbendorf, Landkreis, Maurburg, Hessen, Germany. 1869 – Died – Sophia Elizabeth STRASSMAN – Sophia is my 4th-great-grandmother on my mother’s side. She was born on 23 Jun 1809 in Wahmbeck, Hanover, Germany. In 1844, she married Friedrich MUHM and settled in Washington County, Wisconsin. She passed away at Germantown, Washington Co., Wisconsin and is buried nearby at Christ Evangelical Cemetery in the small town of Dhiensville. 1930 – Died – Martha ZALEWSKI – Martha is my great-great-aunt on my father’s side. She was born 10 Sep 1885 in German Poland/Prussia. She immigrated with her family to Milwaukee in 1889. She married John STRELKA and passed away in Milwaukee. She is buried near her family at Holy Cross Cemetery in Milwaukee. 1835 – Died – Joseph LAURENT – Joseph is my 5th-great-grandfather on my mother’s side. He married Marie Catherine MOUREAU and passed away at Biez, Chaumont-Gistoux, Wallon Brabant, Belgium. 1756 – Died – Georges QUINET – Georges is my 8th-great-grandfather on my father’s side. He was born about 1689 and married Catherine GENAVOIS in 1711. Together, they had 9 children, including my ancestor Pierre Francois QUINET. Georges passed away at Haute-Saône, Franche-Comté, France. 1841 – Died – Constant Joseph LAURENT – Constant is my 4th-great-grandfather on my mother’s side. He married Marie Josephe BERO in 1809 and had 4 children, including my ancestor Jean-Baptiste LAURENT. He passed away at Biez, Chaumont-Gistoux, Wallon Brabant, Belgium. Joseph Troka and his wife, Clara. 1853 – Died – Marie Josephe BERO – Marie is my 4th-great-grandmother on my mother’s side. She was presumably born in Belgium, but her info is unknown. She married Constant Joseph LAURENT in 1809 and had 4 children, including my ancestor Jean-Baptiste LAURENT. She passed away at Biez, Chaumont-Gistoux, Wallon Brabant, Belgium. 1871 – Born – Joseph TROKA – Joseph is my 3rd-great-grandfather on my father’s side. He was born in Poland/Prussia and immigrated to America in 1888 or 1889 settling in Milwaukee. He married Clara SZULTA at St. Hedwig’s Church in Milwaukee on 29 Jan 1894. Joseph was tragically hit and killed by a drunk driver on his way to church on New Year’s morning 1962. You can see a partial transcription of the story on his family page. 1872 – Died – Johann Peter FIRMENICH – Peter is my 4th-great-grandfather on my father’s side. He was born about 7 Jul 1794 in Koeln, Rheinland, Prussia. He immigrated to America with his family in 1847 settling just north of Milwaukee. He passed away at Brown Co., Wisconsin. 1863 – Died – Friedrich MUHM – Friedrich is my 4th-great-grandfather on my mother’s side. He was born on 20 Feb 1801 in Schwbendorf, Landkreis, Maurburg, Hessen, Germany. He married Sophia Elizabeth STRASSMAN in 1844. They moved to the Germantown, Washington Co., Wisconsin area where Friedrich passed away. 1903 – Died – Janneke DEES – Janneke is my 4th-great-grandmother on my mother’s side. She was born about 1817 at Biervliet, Zeeland, Netherlands. She married Jacobus Bernardus VAN PARIJS in 1835 and had 5 children, including my ancestor Charles Ludovicus VAN PARIJS. She passed away in IJzendijke, Zeeland, Netherlands. 1818 – Died – Gertrude OPPERMAN – Gertrude is my 5th-great-grandmother on my mother’s side. She was born about 1782 in Germany. She married Friedrich Ernest MUHM and had 2 children. She passed away in Schwbendorf, Landkreis, Maurburg, Hessen, Germany. One day late. Oops. 3-day weekends confuse me. 1852 – Born – Ida SCHAVANDIE – Ida is my 3rd-great-grandmother on my mother’s side. She was born in Prussia. In March 1870, she married Peter MUHM in Palatine, New York. She passed away on 12 Nov 1934 at Antigo, Langlade Co., Wisconsin. She is buried there at Elmwood Cemetery. 1857 – Married – Jean Baptiste LAURENT & Olivine Marie ST. LOUIS – Jean and Olivine are my 3rd-great-grandparents on my mother’s side. Jean was born in Belgium in 1825, while Olivine was born in Quebec, Canada in 1835. They married at Little Chute, Outagamie Co., Wisconsin and had 9 children including my ancestor, Mary Philomene LAURENT. Members of the Michael Corrigan family were natives of County Tyrone. They were still residents of Ireland when Patrick was baptized at the age of two days in Killeeshil Parish in February, 1819. They emigrated to Canada circa 1823 where Michael initiated Upper Canada Land Petitions on behalf of himself and his young sons. Then they briefly removed to the United States, likely to New York where their son, Hugh, was born. It was said that William was born during their voyage to North America. In time, the Corrigan family settled on Brock Township, and apparently lived their throughout the 1830s. By the time of the 1852 census, Michael, Rosina and family resided in Mara on the West 1/2 of LOT 15 CON 7. Michael passed away in 1859 in Mara and is presumably buried there. 1891 – Married – Joseph DEBROUX & Mary Philomene LAURENT – Joseph and Mary are my great-great-grandparents on my mother’s side. Joseph was born abotu 1864 and Mary was born in 1891 in Wisconsin. 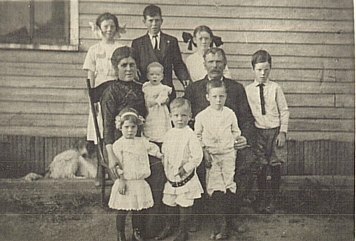 They married at Langlade Co., Wisconsin and had 8 children including my great-grandfather, Leon Joseph DEBROUX. 1723 – Died – Marguerite BROSSIER – Marguerite is my 9th-great-grandmother on my father’s side. She was born about 1653. She married Louis QUINET and had 4 children including my ancestor, Georges QUINET. 1784 – Born – Phillipus Jacobus Bernardus van PARIJS – Phillipus is my 5th-great-grandfather on my mother’s side. He was born at Watervliet, East Flanders, Belgium. He married Anna Theresia JUNIS in 1809. He passed away on 1 Sep 1832 at Schoondijke, Netherlands. 1979 – Died – Madora Martha Louise LAST – Madora is my great-grandmother on my mother’s side. She was born 14 May 1898 in Grafton, Ozaukee Co., Wisconsin. In 1919 she married Arthur Frederick THIELKE. She passed away at Grafton and is buried there at St. Paul’s Cemetery. 1846 – Born – Johanna KREBBEKX – Johanna is my 3rd-great-grandmother on my mother’s side. She was born in Holland. She married Charles Ludovicus van PARIJS in 1870. After immigrating to Wisconsin in about 1874, she passed away on 9 Jul 1920 at Phlox, Langlade Co., Wisconsin. 1709 – Died – Jeanne CERISIER – Jeanne is my 10th-great-grandmother on my mother’s side. She was born about 1627 at Amboise, Tours, Touraine, Indre-et-Loire, France. She married Francois DUCLOS in 1665. She passed away at Batiscan, Champlain, Quebec, Canada. 1751 – Married – Pierre François QUINET & Thérèse DARD – Pierre and Thérèse are my 7th-great-grandparents on my father’s side. They were married in Menoux, Haute-Saône, France. I am related to them through their son Antoine QUINET, who was born in 1757. 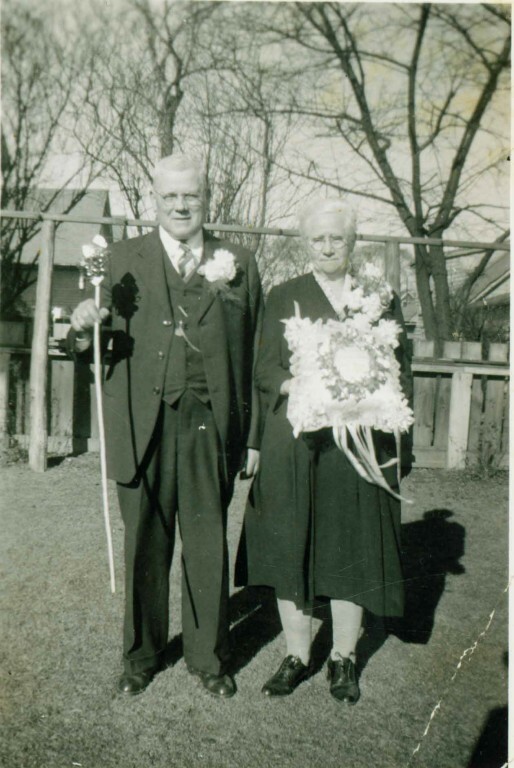 1919 – Married – Arthur Frederick THIELKE & Madora Martha Louise LAST – Arthur and Madora are my great-grandparents on my mother’s side. They married marred in Port Washington, Ozaukee Co., Wisconsin. They had four children, including my grandfather, LeRoy. Arthur passed away in 1964 and Madora remarried. She passed away in 1979. They are both buried at St. Paul’s Cemetery in Grafton, Ozaukee Co., Wisconsin. 1900 – Died – Henry STEARNS – Henry is my 3rd-great-grandfather on my father’s side. He was born 19 Apr 1835 in Württemberg, Germany. He married Margaret SCHUMACHER in 1862. He immigrated with his famiyl to Wisconsin in about 1873 where he lived until he passed away. 1734 – Died – Genevieve PAILLARD – Genevieve is my 8th-great-grandmother on my mother’s side. She was born 10 Dec 1685 in Montreal, Quebec, Canada. She married Louis CHEVREFILS-BELISLE in 1705. She passed away in Montral, Quebec, Canada. 1758 – Born – Mary Marguerite BOILLAGEON – Mary is my 6th-great-grandmother on my mother’s side. She was born at Laperade, Quebec, Canada. She married Charles Francois CLOUTIER in 1782. 1886 – Died – Jean-Baptiste LAURENT – Jean-Baptiste is my 3rd-great-grandfather on my mother’s side. He was born 18 Jan 1825 in Biez, Chaumont-Gistoux, Wallon Brabant, Belgium. He married Olivine Marie ST. LOUIS on 7 Sep 1857 at Little Chute, Outagamie Co., Wisconsin. He passed away at Phlox, Langlade Co., Wisconsin and is buried at St. Joseph’s Catholic Cemetery in Norwood, Langlade Co., Wisconsin. 1678 – Died – Francois CHEVREFILS – Francois is my 9th-great-grandfather on my mother’s side. He was born in 1643 at Perigueux, Perigord, Dordogne, France. He married Marie LAUNY on 18 Mar 1678 in St. Ours, Richelieu, Quebec, Canada. Francois passed away in St. Ours. 1848 – Born – Peter MUHM – Peter is my 3rd-great-grandfather on my mother’s side. Peter was born in Hanover, Germany. He married my 3rd-great-grandmother, Ida SCHAVANDIE, on 18 Apr 1870 at Germantown, Washington Co., Wisconsin according to their marriage certificate. They had 3 children. Peter passed away on 6 May 1888 in Langlade Co., Wisconsin. 1840 – Married – Jacobus Franciscus KREBBEKX and Maria Sophia SCHALLOIR. 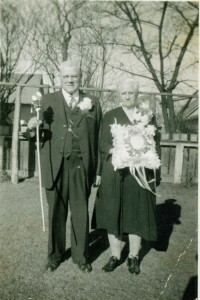 Jacobus and Maria are my 4th-great-grandparents on my mother’s side. They were married in Hoofdplaat, Zeeland, Netherlands. They had two children, including my 3rd-great-grandmother, Johanna Maria KREBBEKX. 1920 – Died – Olivie Marie ST. LOUIS – Olivine is my 3rd-great-grandmother on my mother’s side. She was born 17 Sep 1835 in Yamachiche, St. Maurice, Quebec, Canada. She married Jean-Baptiste LAURENT on 7 Sep 1857. According to notes in the History of Outagamie County [Wisconsin], Olivine was the first school teacher in Phlox, Wisconsin. She passed away in Phlox at the age of 85. 1835 – Married – Jacobus Bernardus VAN PARIJS and Janneke DEES. Jacobus and Janneke are my 4th-great-grandparents on my mother’s side. They were married at Ijzendijke, Zeeland, Netherlands. They had 5 children, including my 3rd-great-grandfather, Charles Ludovicus VAN PARIJS. 1893 – Born – Joseph Frank ZALEWSKI – Joseph is my great-grandfather on my father’s side. 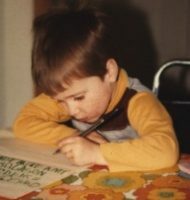 Joseph was born in Milwaukee, Wisconsin to Frank J ZALEWSKI, Sr and Anna LINDNER. He was the 4th child and the first to be born in Milwaukee. After serving in the Army in World War I, Joseph married my great-grandmother, Emily M TROKA, in about 1919. Emily passed away at a young age in 1941. He lived with his new wife until he passed away on 15 aug 1981 in Cedarburg, Ozaukee Co., Wisconsin. He is buried at Holy Cross Cemetery in Milwaukee. 1646 – Born – Nicolaes VAN CRAYBECK – Nicolaes is my 9th-great-grandfather on my mother’s side. He was born in St. Lambertus, Herck, Belgium. He married my 9th-great-grandmother, Helena WAGEMANS, on 9 Aug 1671. He passed away on 26 Mar 1721 in Kuringen, Belgium. 1743 – Died – Madeleine BENOIT – Madeleine is my 7th-great-grandmother on my mother’s side. She was born 19 Jun 1965 in Trois-Rivieres, St. Maurice, Quebec, Canada. She married Gabriel Robidas dit MANSEAU on 16 Sep 1715. They had 12 children and she passed away at Baie-du-Febvre, Yamaska, Quebec, Canada.